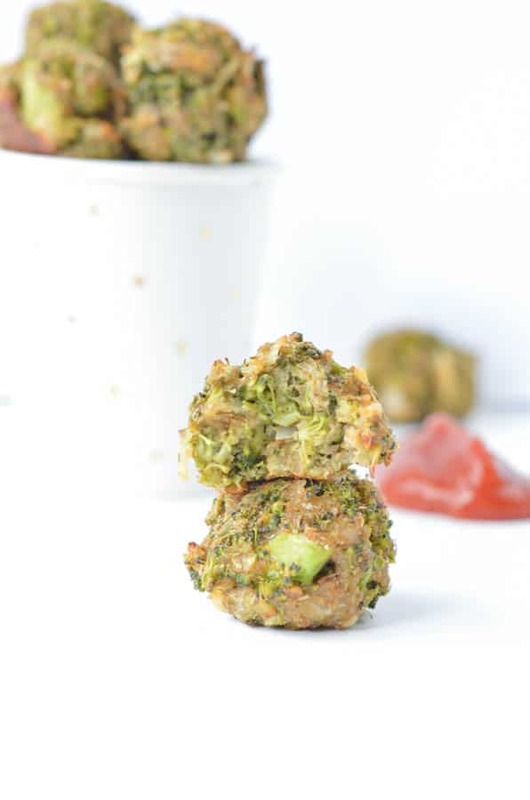 Healthy Baked Broccoli Balls are delicious broccoli cheese bites for your baby first food around 1 year. It also makes a simple broccoli appetizer recipe for the grown up, delicious dipped in any sauce like tomato sauce, hummus or guacamole. Here we are, Luka is almost 10 months and he loves eating food by himself. He already have 10 teeth – I know, I can’t believe it myself Emma barely had 2 teeth at this age and I would never have offer finger food at her age. Anyway, Luka want his own food and he loves broccoli. I know he tolerate eggs, oat and wheat very well too so I choose to make his first finger food with all those ingredients. I inspired myself from our favorite spinach balls recipe, an healthy appetizer I make very often for my friends and family. 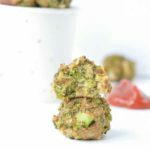 You probably seen tons of broccoli balls recipe around but my recipe is a bit more nourishing and baby friendly of course! First, I used a combo of rolled oats and gluten free wholegrain breadcrumb to increase the fiber. Then, I used only the softer parts of the broccoli florets – the top that I chopped finely. Tips: keep the broccoli feet for a soup later! Finally, I steamed the broccoli for 4-5 minutes to avoid loosing nutrient from the vegetables. Well, you can boil them and the recipe will work well but steaming is better to keep the nutrient and green color. I added one large egg and low salt grated cheese – mozzarella or emmental are the best for babies. So, this is how it looks like a green moist batter full of tiny broccoli pieces. I roll the broccoli balls in my hands and baked them on a baking sheet covered with parchment paper. I slightly oil my hands with olive oil to roll the broccoli balls – makes them easier to roll and it avoids sticky hands too. Well, I have to wash my hands between each 3-4 balls as it was sticky anyway. Look at those broccoli balls! How cute are they !? This recipe makes about 20 broccoli balls. I baked all of them and freeze some in plastic zip bag for Emma dinner during the week. It rewarm very well – no need to defrost – on a hot oven at 160 C for few minutes. We also eat them as an healthy appetizer. When it is for us I am adding salt and garlic powder for more flavor. See notes in the recipe card. I love to dip them into my sugar free tomato sauce or spinach avocado dip. But again, for babies simply offer the broccoli balls as is slightly warm to avoid burning of course. Luka loves them lukewarm or cold. 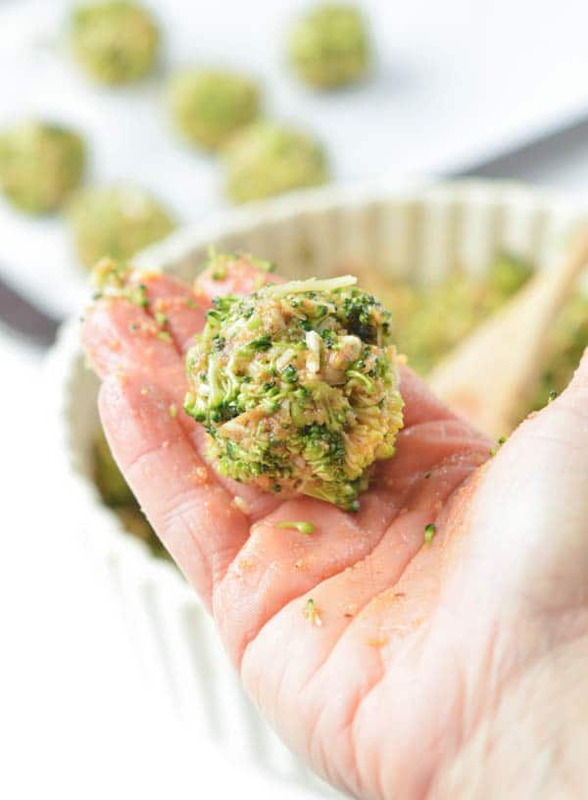 Healthy Baked Broccoli Balls are delicious broccoli cheese bites. A simple broccoli appetizer recipes with broccoli (no precooking required! ), gluten free breadcrumb, eggs and a bite of cheese! 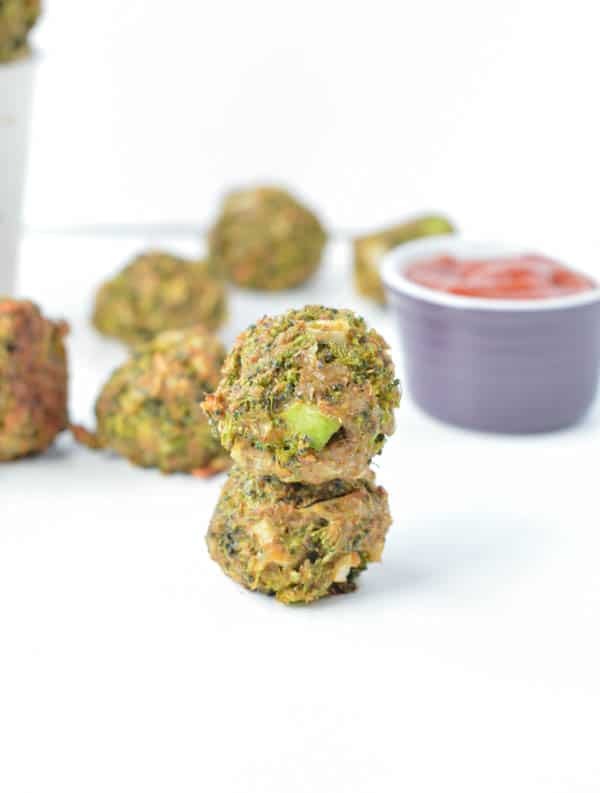 Broccoli cheese balls toddlers loves. Preheat the oven to 200 C(400 F). Cover a baking sheet with parchment paper, slightly oil the paper with olive oil spray. Set aside. Remove the broccoli feet and finely chop the broccoli head into tiny piece - it will precook faster. Place into a steamer and steam for 2-4 minutes or until slightly tender. Drain and rinse with cold water to stop the cooking process and maintain the green colors. 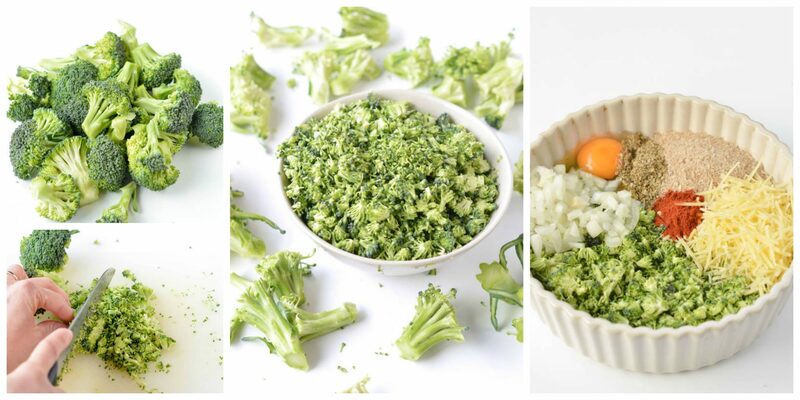 Don't overcook the broccoli to avoid a puree, All you want is slight softer broccoli pieces. You can also boil the broccoli pieces in a pot filled with boiling water, same 2-3 minutes, drain, rinse with cold water. 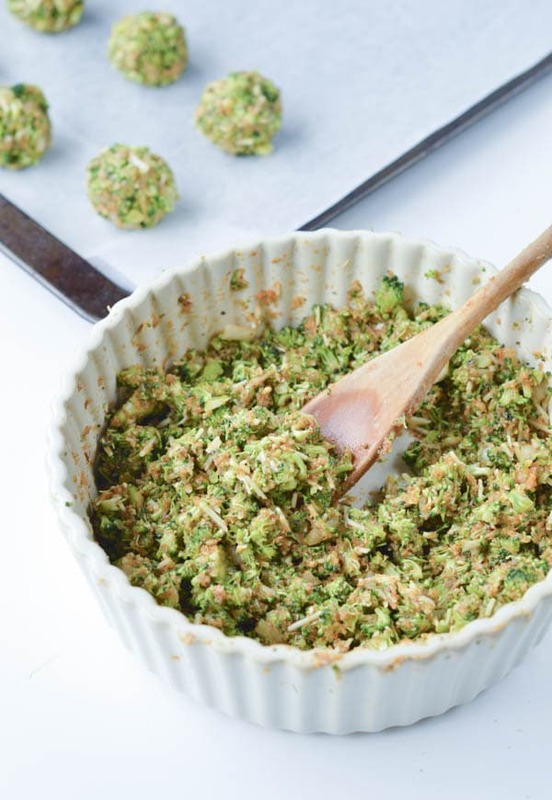 Transfer the broccoli pieces into a mixing bowl, cool down for 3-5 minutes then add all the other ingredients : breadcrumb, oat flour, eggs, onions, paprika, oregano, cheese and egg. Combine with a spatula until it forms a batter that you can easily shape into balls with your hands. Slightly oil your hands with vegetable oil, scoop about a tablespoon of mixture and roll in your hands into balls. Press and roll until it comes together and shape well. I personally washed my hands between 3-4 balls as it sticks to my hands a lot. Place the balls on the prepared cooking sheet, leaving a thumb size between each broccoli balls. Bake for 15 minutes or until golden on the outside. Serve medium hot for babies or hot out of the oven as an appetizer. 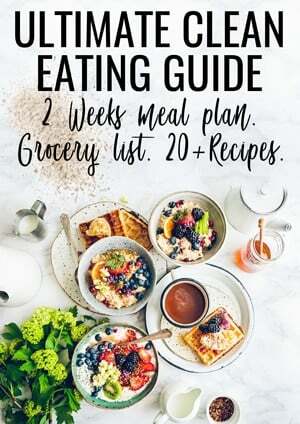 Salt: this recipe has been developed for my 10 months baby that is why there is NO added salt and I am using Japanese Panko breadcrumb here with less than 2% of added salt or sugar. If you make this recipe as an appetizer for adult I recommend you add 1/2 teaspoon salt. Appetizers options: if you wan to turn this recipe as a tasty appetizer add 1/2 teaspoon garlic powder and 1/2 teaspoon salt. Freezing: you can freeze the baked broccoli balls into zipping bag. Wait until they are fully cool down, freeze up to a month. Defrost in the oven, place the frozen broccoli balls on a cooking tray covered with parchment paper. Cook until defrost and crispy - about 8 minutes at 350F. Don't overcook are they will dry out. Appetizer eating suggestion: as an appetizer you can serve those with dipping sauce like my spinach avocado dip or my sugar free tomato sauce. 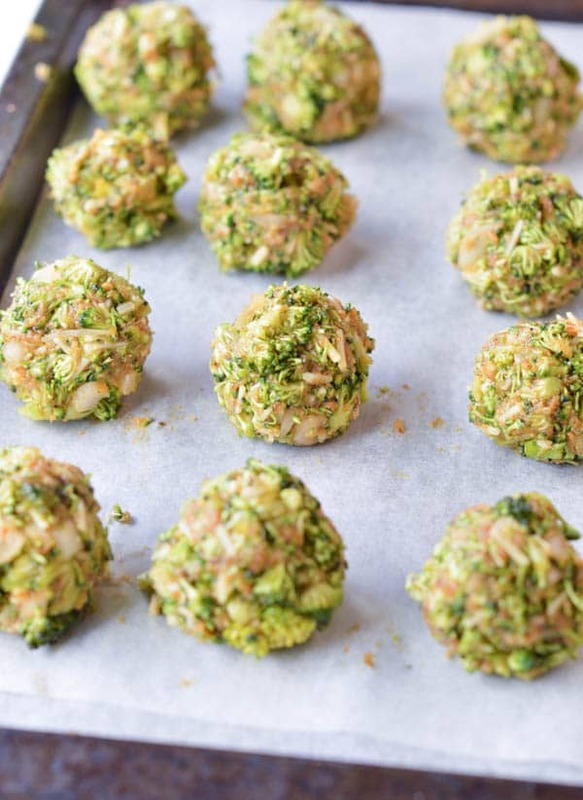 This recipe makes 20 baked broccoli balls. Nutrition panel is for 1 broccoli ball. Babies eat one or two of those balls at 10 months. Adult serving is around 6-8 as an appetizer. Hello Carine! Thank you for your great ideas and wonderful recipes. I have been blessed with 10 grandkids and ANY recipe that helps promote vegetables is appreciated! And these are “fun sized ” for the youngest to the oldest! I always look forward to your emails! Warm wishes to you and your family! Wow I am so happy I just came across your site! I have been so nervous about introducing new foods into my baby’s diet and I don’t want her to have any baddies in her body so I want to make all of her food myself. I’m so glad I came across this 🙂 Thank you!